Beau & I: As the name of our establishment depicts, this is a team effort by Beau and Imelda to give top-class service to our guests and to ensure that they will remember their stay with us. 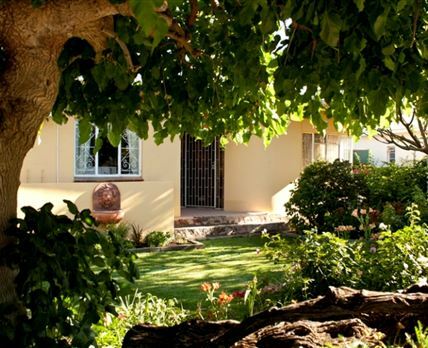 Beau and I is situated in the heart of Graaff-Reinet, within walking distance of shops, restaurants, museums, and places of interest. A warm, relaxed ambience has been created with particular emphasis on comfort to make our guests feel at home. We offer comfortable accommodation set in a tranquil garden with a patio and barbecue area. Heaters and electric blankets ensure a cosy sleep during those cold winter nights, and two of the en-suite rooms also have air-conditioners. In summer, breakfast is served on the patio with its beautiful collection of plants. In addition, a bar fridge, a microwave oven, a toaster and a kettle are at the disposal of our guests for their convenience. Facilities include private entrances, linen and towels, toiletries, continental breakfasts, full breakfasts, tea and coffee with home-baked rusks, ice in summer, a fireplace, laundry and barbecue facilities, Wi-Fi and safe off-street parking. Our golf course, which is within 5 km of the town, is rated as one of the best 9-hole golf courses in South Africa. It is an oasis in the middle of the barren Karoo landscape and something that the true golfer must experience. Click here to enquire at Beau & I.